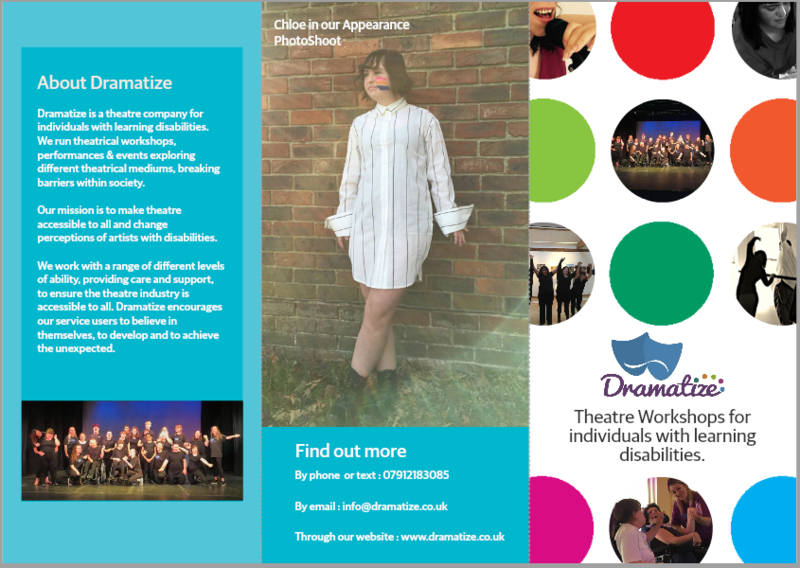 Dramatize Academy is a theatrical programme to develop each individuals confidence and creativity through the arts. On the course we will cover performing modules such as Physical Theatre, Stage Make Up, Dance, Acting and Voice, as well as technical modules such as Stage Management and Design. The course runs five days a week Monday - Friday, 9am-4pm. You can attend on a full or part time basis. Within Dramatize Academy, each adult will work towards gaining An Arts Award – a recognised qualification equivalent to a GCSE or A-Level. This qualification is suitable for all abilities and offers different levels to work towards. Each adult will have personal targets to work towards each year. Our staff work closely with parents and/or carers, holding review meetings to discuss individual progress. Our programme is suitable for students with a learning disability or disability who are able to manage their own behaviour within a variety of settings. If the individual already attends a provision, this does not narrow their options. Each young adult can use their Self-Directed Support (SDS) or other funding from their care package, to attend several provisions. We are happy to advise you on this. There is a ground floor wheelchair friendly toilet / bathroom available on site. All staff members are fully inducted and trained in meeting individual needs. This includes class based and online training sessions. There is a thorough induction process where each supported individual's care plan and risk management plan is demonstrated and shadowed by the centre management. We cater for individualized dietary needs (dairy, gluten free, religious reasons etc). Our activities are tailored and specialized for individuals with additional needs and with complex care / health requirements. We cater for all abilities of learning difficulties, autism and mental health conditions. You can send yourself a reminder email three days prior to events taking place. ' Dramatize Academy ' took place on 16 April 2019.